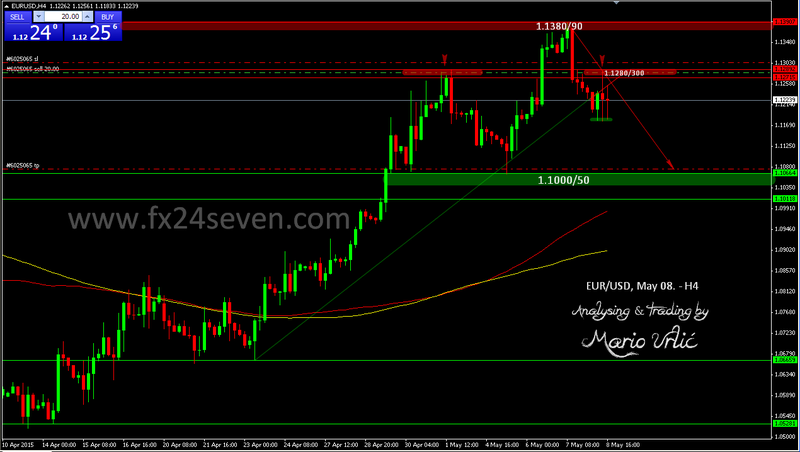 Based on my ‘H&S NFP prediction’, let me present my EUR/USD short position, which I left opened for the next week. After the NFP numbers were out, the first reaction was opposite and the euro was pushed up to the resistance level, where I have placed my short at 1.1282. My SL at that moment was at 1.1312 because I was sure it will not be in danger there. The pair went crazy in the first hour, like I wrote it will be, down/up 100 pips for two times, but I sow that my position isn’t in danger and I decided to wait furder, preaty sure it will go down again. Why? NFP numbers were in the line of the expetations, 223K vs 224K, which was a good numbers for the US dollar, not much better then expetations, but much better then previous numbers, which was revised lower to only 83K. As you can see, the pair was well supported at 1.1178/83 on each decline and pushed back up, but I waited furder and at the end I decided to leave my position opened for the next week. This print screen was capted in the late afternoon, but the pair closed the day even lower at 1.1207. Based on my previous analysis I have placed my target or T/P to 1.1080, but I will follow furder development and decided what to do next week. Important level for my decision will be this previous support at 1.1178/83 and moves near this down trendline. It’s great short entry with RR ratio of 1:10, it will be great to reach the target!